Volunteers attempt to rescue the male pilot whale and nurse it back to health. 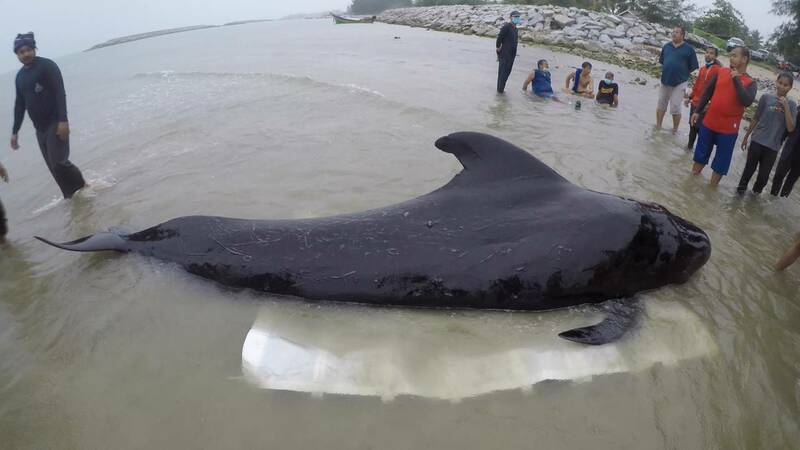 BANGKOK, Thailand (CNN) - A short-fin male pilot whale has died in Southern Thailand after ingesting more than 17 lbs of plastic bags and packaging, a sobering casualty of the waste littering the world's oceans. During an autopsy veterinarians removed more than 80 plastic bags from the whale's stomach, said Jatuporn Burutpat, Director-General to Thailand's Department of Marine and Coastal Resources. Officials say the whale was spotted by locals on May 28 looking ill and floating abnormally. Government veterinarians were dispatched to care for the whale and were joined later by members of a local whale conservancy group. Photos posted on the Facebook page for ThaiWhales, a conservation group, showed volunteers tending to the sick whale, shading the mammal while giving it medicine and fluids. Volunteers and veterinarians worked for several days to try and save the whale. Burutpat said that on June 1, the whale started to vomit pieces of plastic. In a post on Facebook, ThaiWhales said the animal "struggled fiercely" as it tried to purge its body of the plastic. The whale died later that afternoon. A recent study by the UK government warns that without intervention, the amount of plastic cluttering the Earth's oceans will triple within a decade. The report from the UK Government Office for Science found that 70% of marine litter is non-degradable plastic. Burupat said the Thai government will seek to raise awareness about the problem for World Ocean's Day on June 8.